Lego’s are a great past time for children, and adults of all ages as they have endless possibilities to build with. The Lego land discovery center in Arizona is the perfect place for any family trip. Inside the discovery center kids can see all the creations that can be made with Legos from big to small. Outside of the exhibits that you can see there are lego stations in which you are able to play with the legos. There are two stations one with normal legos and one with the duplo legos which are bigger for smaller children that aren’t ready for the tiny pieces of normal legos. For one price all of the admission cost is included so that you can just get your ticket and have access to all of the exhibits at the discovery center. Along with the building capabilities while at the lego discovery center you will learn how legos are made and the process that it takes to get legos to how everyone knows them. 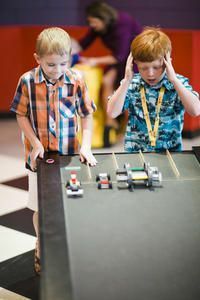 Everything at the lego discovery center is family friendly and safe for all ages to be around so that families can enjoy the experience there knowing that their children are safe, and able to just have fun and be a kid with the many hands on exhibits throughout the discovery center. There is hotel pick up and drop off for those that are out of town and are coming to the discovery center for their vacation with their family as the center tries to make the trip as smooth as possible for all guests. Located in Tempe, approximately 10 miles from Phoenix, LEGOLAND Discovery Center is an indoor attraction ideal for children aged 3 to 10. It's one of the top things to do in the area for kids and their families. Once inside, venture through the Mini figure entrance, and strike a pose for a photo shoot with a custom LEGO background. Then take an elevator to the LEGO Factory for a virtual tour of the actual factory in Denmark. After learning how LEGO bricks are made and playing a game, hop on a chariot at the Kingdom Quest Laser Rider. Use your laser to zap skeletons and ogres so you can rescue a princess. Make you way to Miniland, where you'll find iconic, local attractions made out of LEGO. Next, check out the DUPLO Farm, where little tikes can go to work, or enjoy the play kitchen and living room karaoke at Olivia's house, based on LEGO Friends. In the LEGO Fire Academy and LEGO Construction Site play zones, young ones can climb to the top of walls and go down the slide, or build with giant soft LEGO bricks. Don't miss pedaling magic bikes at Merlin's Apprentice! Get in the fast lane to construct and test race cars at LEGO Racers, where you can go head-to-head against the clock, or try your hand at building the tallest tower to withstand an earthquake at the Earthquake Tables. Kids can also learn more building tips and tricks by attending a class in the Master Builder Academy, where expert instructors take them through a Minibuild. You can take home your creations for an additional fee. When the family is ready for a break, see special effects at the 4D cinema where 15-minute movies play throughout the day. Or head to the cafe for sandwiches and snacks (own expense), and stop by the gift shop on your way out for that perfect LEGO set. Please note: LEGOLAND Discovery Center Arizona is a children's attraction; to promote a safe and family-friendly environment, adults cannot enter without being accompanied by a child.